Kolek, who has grown up on a cattle ranch, embodies Texas heat, with a big, country strong frame that easily generates mid- to upper-90s heat. 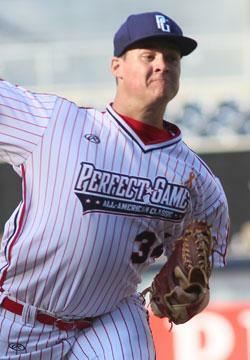 He peaked at 97 mph at the Perfect Game National Showcase and has eclipsed triple digits in other appearances this summer. Kolek also shows the ability to pitch, changing speeds between his fastball, slider and changeup with command, and defines over-powering with a true power approach that is nearly unmatched in his class.